The 5-inch STRIKER Plus 5 ice fishing bundle features support for ClearVü scanning sonar and includes an ice fishing transducer for crisp, clear fish arches and excellent target separation. Built-in GPS and Quickdraw Contour mapping software let you find and mark your favorite spot and return later. Includes rechargeable battery, charger, tilt/swivel unit mount, foam float and a portable carrying case for it all. This transducer is designed for ice fishing. CHIRP sends a continuous sweep of frequencies, ranging from low to high, instead of sending just one. When the frequencies return, CHIRP interprets them individually, gathering a wider range of information for crisp, clear fish arches and excellent target separation. The wide 16-24-degree beam angle covers a large area in the water, so you know what’s coming. Nobody knows the waters you fish better than you and your fellow fishermen. While you are fishing the depths, Quickdraw Contours mapping software creates HD fishing maps of the places you’ve been. No special knowledge is required. Now you can store up to 2 million acres of your Quickdraw Contours maps with 1’ contours. 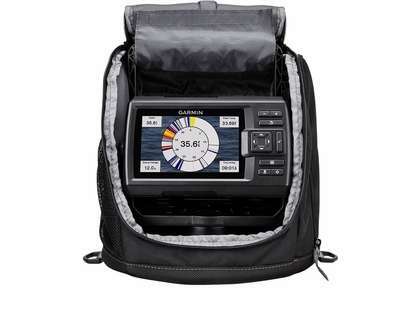 STRIKER provides you with both a fishfinder and flasher all in 1 unit. Anytime you are stationary fishing, such as ice fishing or jigging for crappie, the built-in flasher will show your jig or weighted bait and the depth of fish as they swim into the sonar beam. You can even watch how high your jig is being lifted and dropped and whether fish move toward or away from it. The built-in, high-sensitivity GPS allows you to mark waypoints for different locations. So, if the fish are biting in 1 spot, you can mark it, and return to it on your next trip. It’s also a great tool for finding your way back to your most productive fishing holes. 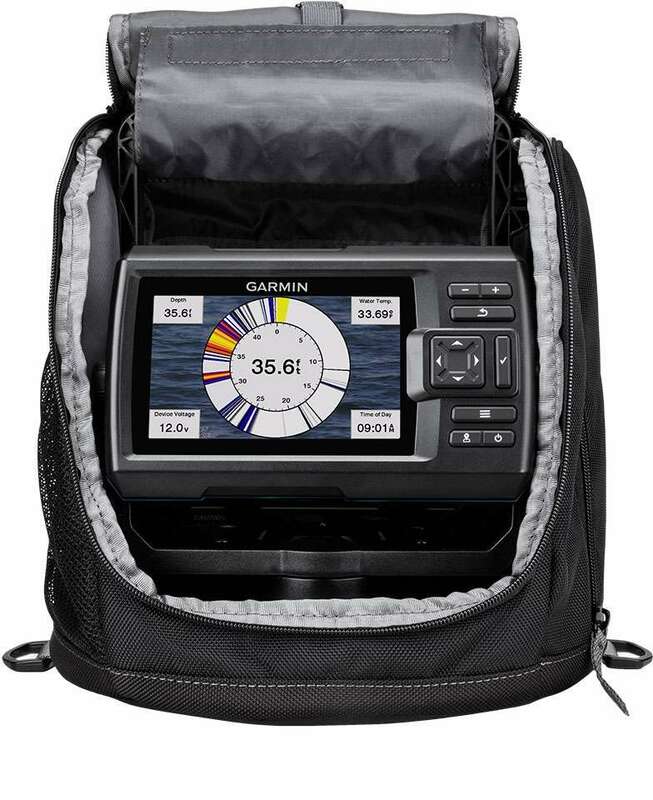 The STRIKER Plus 5cv fishfinder makes fishing a breeze, and it’s built to work in any environment. The bright, sunlight-readable display gives you a clear view of what is below the ice, even on the brightest days. And the larger screen gives you a better view of what is happening below the ice. The intuitive user interface makes it simple to navigate to whatever feature you need, so you are ready for anything. For warm season fishing, add CHIRP ClearVü scanning sonar capabilities to your STRIKER 5 ice fishing kit. For CHIRP ClearVü scanning sonar, add optional Garmin GT20 CHIRP traditional and CHIRP ClearVü scanning sonar (sold separately). For high-performance CHIRP, purchase a GT22 or GT23 (each sold separately).